The National Transportation Safety Board (NTSB) has one overall recommendation for improving road safety: write more tickets. The federal agency released its "most wanted" list of transportation safety policy changes at a National Press Club event in Washington on Monday. Prominent on the board's wish list were 21 recommendations that, if adopted, would have the primary effect of increasing the number of speeding citations issued nationwide. In some cases, the recommendations are contrary to the policies set in law by Congress, state legislatures and the public through local referendum votes. The board, for example, urged the National Highway Traffic Safety Administration (NHTSA) to set a specific number of speeding tickets that must be issued to qualify for federal grant funds. 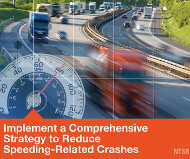 "Identify speeding-related performance measures to be used by local law enforcement agencies, including, but not limited to, the numbers of... speeding citations, and warnings, and establish a consistent method for evaluating data-driven, high-visibility enforcement programs to reduce speeding. NTSB recommendation H-17-019 states. "Disseminate the performance measures and evaluation method to local law enforcement agencies." Most states, including California (CVC 41602), Florida (FS 316.640), New York (LAB 215-a) and Texas (TTC 720.002), have enacted laws that prohibit supervisors from forcing traffic cops to issue a set number of citations. The NTSB seeks to circumvent those laws by encouraging police officers to write more tickets so that their departments are rewarded with additional federal funding. The NTSB also called on federal transportation agencies to promote the use of speed cameras, despite a long-standing prohibition on federal funding for automated ticketing machines. The board called on NHTSA to "assess the effectiveness" of average speed cameras that are used in Europe but have not been adopted in the United States. In addition to the federal ban on photo enforcement funding, sixteen states ban the use of automated ticketing machines (view list), and even more, like California, Texas and Virginia, allow red light cameras but prohibit speed cameras. Even if states changed their laws at the NTSB's urging, more than twenty-five cities have banned speed cameras by referendum (view public votes that banned cameras). In addition to the calls for speed cameras and speeding ticket quotas, the board's most wanted list seeks greater deployment of electronic variable speed limit signs that allow transportation officials to lower speed limits remotely. They also seek to overturn the 85th percentile rule that requires speed limits to be based on the actual speed of traffic in favor of more permissive rules that allow jurisdictions to lower speed limits without an engineering justification. The NTSB under Chairman Robert L. Sumwalt has been active in pushing photo radar. Sumwalt was President Barack Obama's choice for the post and was reappointed by President Donald Trump. The current report was supposed to be released last month, but it was delayed by the government shutdown.